Here I am, back at Hardrock for the fourth time. 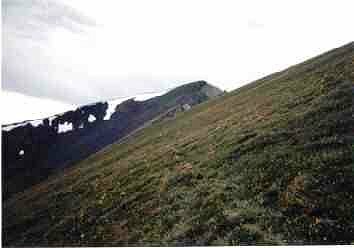 The climb to Dives-Little Giant Pass near 13,000 ft.
Little Giant Mine as seen from the trail. ... and steep. Bozena Maslanka (last official finisher in 47:49) descends into Maggie Gulch. Nobody was running up Upchuck Ridge, but plenty of people were crawling. 14,048 ft. Handies Peak from the top of Upchuck Ridge now appears from behind a false summit. 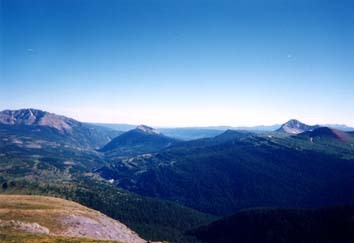 There is a steep dropoff to the right of Upchuck Ridge offering spectacular views. If you are afraid of heights, then Hardrock is not for you. 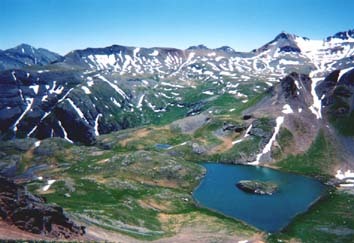 American Basin from the summit of Handies Peak. The course descends the low area to the right at 12,400 ft, then climbs back up to 13,020 ft over the saddle at far right before descending again into Grouse Gulch. 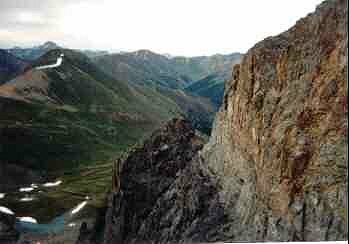 The Bear Creek trail into Ouray features spectacular dropoffs of hundreds of feet into a canyon. I took this picture a few days before the race, since we do this section at night. 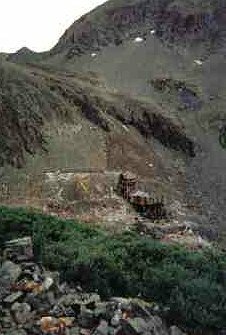 Note how the trail crosses a rubble filled gully to the left. 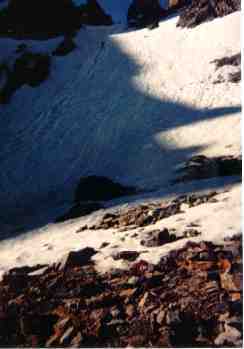 A climber ascends the final pitch of 13,100 ft. Virginius Pass with the help of a rope on the second day of the race. Climbing the 45 degree snow slope wasn't bad in the daylight, but the faster runners who did this before sunrise had to contend with solid ice. Climbing the south side of Grant-Swamp Pass. Fortunately there wasn't much snow this year. This picture and the next eight were taken by Aki Inoue during a training run 3 days before the race. At the top of Grant-Swamp Pass at 13,000 ft. 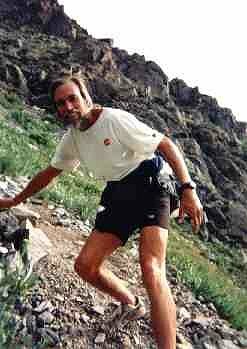 The plaque is dedicated to Joel Zucker who died 2 days after finishing this third Hardrock in 1998. 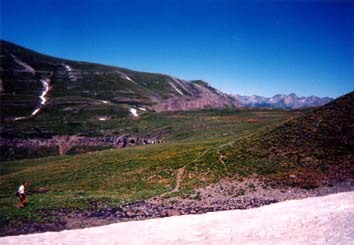 Looking back toward Oscar's Pass. Descending the north side of Grant-Swamp pass. Descending into Ice Lake Basin. 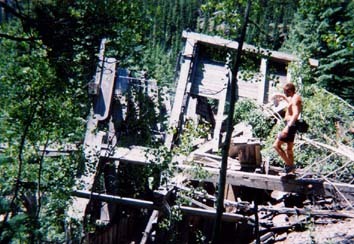 An abandoned mine on the Ice Lake trail. Putnam Ridge, the last climb of the race. Most people climbed this in darkness, fog, and near-freezing rain on the second night. View from Putnam Ridge when the weather is good. 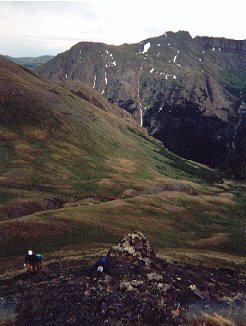 In the eighth annual Hardrock 100 mile run held in Silverton, Colorado on July 7, 2000, 116 runners started, 58 finished within the 48 hour cutoff, and Kirk Apt of Crested Butte set a new course record of 29:35:00. The course features 33,000 feet of climb at elevations ranging from 7700 to 14,048 feet. There is less than a mile of pavement total. This was the 8'th annual race. It has been held every year since 1992, except for 1995 when the race was cancelled due to excessive snowpack. The snow levels were unusually low this year, resuting in some fast times, but overall the finish rate was lower with slower average times overall, due to being run in the "hard" direction. The race is a loop course, reversing direction each year. This year, we had most of the good roads in the uphill direction, followed by steep descents on trails. The race started at 6:00 AM Friday. By 8:10 AM, the first runners had come into Cunningham Gulch at 9.6 miles, after climbing from 9300 to 13,000 feet on good jeep roads and trails, and descending to 10,380 ft. on very steep trails. I arrived about 9:00 in about 80'th place, about two thirds of the way back in the pack. The next aid station was Maggie Gulch at 16.5 miles, and involved another long climb to 13,060 feet and steep descent to 11,640 ft. Tim Cannon was first to arrive at 10:02 (about a 4 MPH pace), followed by eventual winner Kirk Apt at 10:08. I arrived at 11:38, still back in the pack. Randy Davidson of Arkansas was the first to drop out of the race at 12:34. The next section is relatively easy. We make a short climb to 12,530 ft, then a long, almost flat section through the remote Pole Creek aid station at 21.6 miles, then ending with a descent on good trails in light rain to the major aid station at Sherman, 31.6 miles at 9640 ft. Pole Creek is remote, with all aid supplies carried in from Maggie by mule, so it is not possible to drop out here. The first runners to reach Sherman arrived at 1:01 PM, with several runners including Apt arriving within 10 minutes. I arrived at 3:45 PM, about 70'th place. Five runners called it quits. Now it gets hard. After a 2 mile uphill hike on jeep roads, we head north up the very steep Boulder Gulch trail to Handies Peak, climbing from 10,590 ft. to 14,048 ft. in 3.1 miles, an average 21% grade (twice as steep as the Mt. Washington Road Race or the Pikes Peak marathon). 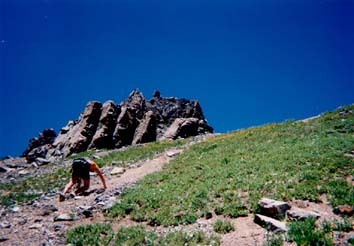 The climb up Upchuck Ridge above treeline (11,800 ft) is much steeper, with 50% grades requiring climbing with hands. 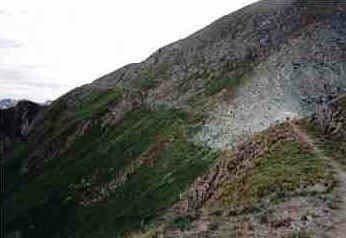 From there we descend to 12,400 ft. in American Basin on steep trails, climb back up to 13,020 ft., then descend into Grouse Gulch at 10,710 ft. The top runners reached Grouse at 4:30 PM, but many runners arrived after dark, when psychologically the race gets hard and energy levels get low. Many runners needed 5 or 6 hours to cover this 11 mile segment. 24 runners dropped out here, including Eric Clifton, who had won 12 100 mile races since 1989, and Scott Jurek, who had won Western States two weeks ago. That left 87 runners in the race. I left at 8:51 PM, just after sunset, in 50'th place. Some runners arrived after 1:00 AM. I filled my water bottles with Mt. Dew to keep awake for the next section. 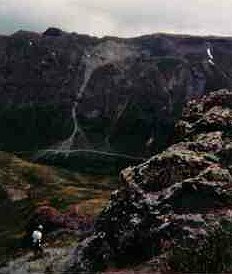 The section was fairly easy, up 6 miles of jeep road to Engineer Pass at 12,910 ft., then down one mile across open tundra to the remote Engineer aid station, where supplies were again carried in. At night I usually try to stay with other runners, in this case 60 year old Hans Dieter Weisshaar of Germany, who was running his eighth 100 miler this year, and Colin Kingsford of Canada. We agreed to stay together until sunrise. The skies were clear with temperatures in the 40's. While hiking up the road, I was surprised to catch up to Aki Inoue of Japan. He had some top finishes, including 24 hours at the Massanutten Mt. 100, but had arrived only 4 days ago without any altitude acclimation other than training on 12,500 ft. Mt. Fuji, but sleeping at low altitude. This was inadequate, as he was vomiting every 20 minutes from altitude sickness, and had been for most of the race. He fell behind, and spent 2 hours at the Engineer aid station, where we thought he would drop. I was amazed to find out later that he finished in 47:13. From Engineer at midnight, we descended 8 miles of trail to Ouray, the next major aid station at mile 58, and the lowest point in the race at 7680 ft. The trail traverses a steep canyon wall above the Uncompaghre river with treacherous dropoffs for about 2 miles, then crosses the river where a rope had been placed across. Almost everyone did this section in the dark, with the top runners reaching Ouray at sunset and the last runners at sunrise. We arrived at 2:42 AM and stayed 15 minutes to eat, and left in 42'nd place. Eight runners dropped here, leaving 79 in the race. 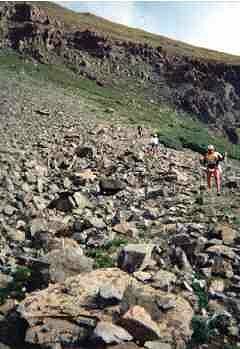 Now we faced the longest climb of the race, over a vertical mile to Virginius Pass at 13,100 ft. The first 7.5 mile section to the Governer Basin aid station was up an easy dirt road, but we did not run. 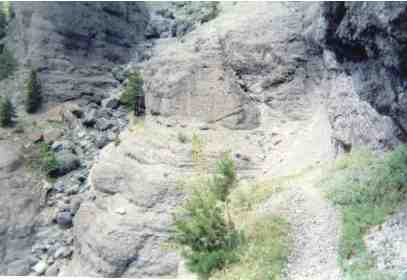 The road, like the trail before, was cut into a canyon wall. In my sleep-deprived stupor, I would sometimes weave over to the edge (no guard rail) and point my flashlight straight down into the abyss hundreds of feet below and marvel at the blackness. We reached the Governor's Basin aid station at sunrise, and Colin and Hans went on ahead while I stopped to eat. The next section to Virginius Pass is only 3.2 miles, but one of the most difficult. 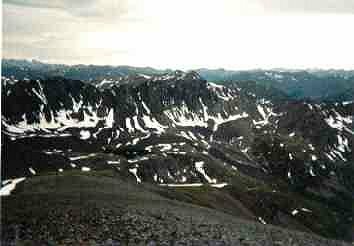 It climbs three pitches of several hundred feet up scree or snow at a 45 degree slope. The last pitch has a 150 ft. rope extending about half way down. To climb this section, I found a piece of wood about a foot long, and used it as an ice axe. Instead of using the rope, I stepped into snow tracks left by previous runners, plunged the stick into the snow, took two steps, plunge, step, step, and in the process passed Colin (who was on the rope) up to the small notch in the knife edge ridge. It was amazing to find an aid station up here, but there it was, "Kroger's Canteen". They had packed everything in on foot and camped overnight. I was very hungry and had three cups of delicious oatmeal. It was 8 AM. From here it is 5 miles of steep downhill trail into Telluride (73.7 miles), which is not really runnable until you get below treeline. This section took me 85 minutes, only 5 minutes slower than Kirk Apt. The problem was that he arrived at 1:25 AM, and it was now 9:41 AM. Jonathan Worswick of California was actually first at 1:18 AM, but would eventually finished sixth. Betsy Kalmayer was the first woman in at 3:37 AM, followed by Sue Johnston 3 minutes later. Eleven runners dropped out here, including Tim Cannon, who was leading at one time. 68 runners remained. It was hot and we were tortured by flies for the long climb up to 13,120 ft. Oscar's Pass. At one point, I climbed across a snowfield in shorts and no shirt, scooped up a handful of snow, and rubbed it all over my body to cool off. I started fast up the good trail out of Telluride (passing Colin and Hans), thanks to the relatively low altitude (8750 ft). This did not last long, however, and the long series of false summits was discouraging. Finally I reached the very steep and almost unrunnably steep jeep road down to Chapman Gulch at 3:44 PM, where the flies were just as bad. It was here that the leaders had sorted themselves out. Kirk Apt was first at 5:07 AM, and eventual women's winner (in 32:20:03) Sue Johnston at 7:30 AM. The next section over Grant Swamp pass is probably the most difficult in the race. After climbing up road, then good trail, then over loose rock, the final 500 feet up to the 12,920 ft. pass is up loose scree, gravel, dirt, and mud on a 45 degree slope. The loose scree saps all your energy. For every step up, you slide 3/4 of the way back down. I managed to climb it between two thunderstorms. I tried to avoid the scree by climbing some nearby rock formations that were even steeper, but the rock was rotton and loose. 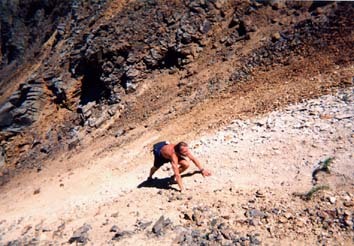 There is a real danger of sending rocks tumbling hundreds of feet onto runners below you. 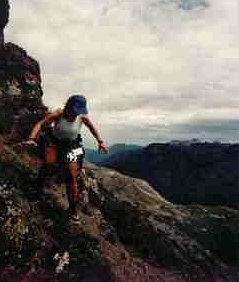 Once over the pass, you descend several miles of primitive trail that is very difficult to run to the Kamm Traverse aid station. For many runners, it was now the start of the second night, psychologically a difficult time, especially after no sleep. To make matters worse, a cold rain now fell and would last most of the night. Many runners were unprepared to spend a cold windy second night in the woods and the mountains above treeline, soaking wet with temperatures in the 30's. With only 12 miles to go, 7 runners dropped out, leaving 59. The last section takes many runners 4 hours in good conditions when the race is run in the other direction and everyone is fresh. Now it is dark and rainy and cold, the runners are fatigued after two days and a night of running, and the mountains are shrouded in fog. This makes it very easy to get lost. There are no glowsticks. The course is marked with reflective metal flags about every 100 feet, and at night you have to scan with your flashlight at each one to find the next one. If the flag is edge on, or fallen over, you won't see it. In the fog, groups of runners would have to fan out at each flag and search for the next one. Two years ago I had gotten lost on this section under clear skies and a full moon. I had a topographical map and a compass, but the mental confusion from two nights without sleep left me unable to use them correctly. I spend 3 hours wandering in circles alone on the frozen tundra surrounded by cliffs, until another runner came along just before sunrise. We both missed the 48 hour cutoff. Strangely, I had hiked the trail a week earlier, but did not recognize it at all. I did not want to make the same mistake again, so I again hiked this section a few days before the race (with Aki Inoue), this time paying careful attention to the terrain. I wondered if the same mental effects would happen again. I would have no crew, pacer, or drop bags. I ran with Tom Rowe for the second night. He finished last year in about 39 hours, but was a bit slower this year. We reached the tundra below Putnam Ridge, the area where I got lost 2 years ago, just before dark. I was cold, so I moved fast to keep warm, and Tom could not keep up. I climbed the ridge alone in the fog and dark, but this time I remembered the route from my training hike. I knew that the markers usually went in a straight line, so after each one I continued straight until I was close enough to the next one for the flashlight to pick it up. At the Putnam aid station with 6 miles to go (present only in the counterclockwise direction), I waited 10 minutes for Tom to arrive. I started shivering at the aid station, even though I was out of the rain, but warmed up once we started moving again. They could not have a campfire because of the restrictions due to the dry weather. What a joke. The next 3 miles of downhill trail were too rocky to run. Then we had one good mile down to the Mineral Creek water crossing. It was roped, but the water was only a foot deep, so we didn't really need it. Tom was having trouble keeping up on the downhills, so with 2 miles to go I left him behind and finished just after midnight in the rain in 42:17 with Tom finishing 5 minutes later. Hans and Colin finished about 3 hours later. In addition in 2000 I ran 21 other races, mostly 5K (about 20 minutes), but also 2 triathlons and several orienteering events. I left for Colorado on June 21, 16 days before Hardrock. My altitude acclimation phase was as follows. June 22, Mt. Bierstadt, 14,060 ft, 4 hours, altitude headache for 8 hours afterwards, sleep at 6000 ft.
June 23, Mt. Democrat, 14,146 ft, 4:30, headache for 2 hours, sleep at 10,000 ft.
June 24, Mt. Princeton from northeast, 14,197 ft, 12:00, about 25 miles, some class 3-4 climbing in a hailstorm, no headache, sleep at 9800. June 25, Mt. Yale, 14,196 ft, 5:20, 13 miles, sleep at 9800. June 26, Mt. Antero, 14,269 ft, 7:00, 18 miles, run all downhills, sleep at 6000. June 27, Long's Peak, turn around at 14,100 ft. with lightning striking the summit 100 ft. above every 2 minutes in a snowstorm, 10:00, 15 miles, class 3 climbing (without 2 inches of snow), sleep at 6000. June 28, walk 3, sleep at 6000. June 29, Mt. 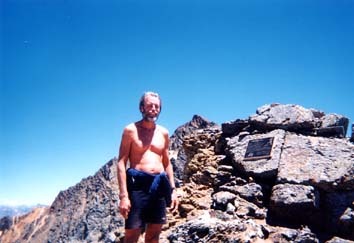 Evans, 14,264 ft, 3:00 hike from summit lake around ridgeline, sleep at 10,100 ft.
June 30, Mt. La Plata from south, 14,336 ft, 6 mi., 6:00. July 1, Mt. 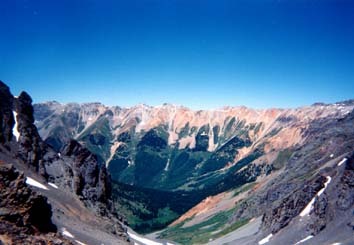 Huron, 14,005 ft, Missouri, 14,067 ft, 12:38, 14 mi, some class 4 descents, sleep at 10,100 ft.
July 2, Mt. Harvard, 14,414 ft, Columbia, 14.071 ft, 13 mi. 9:00, sleep at 9900. 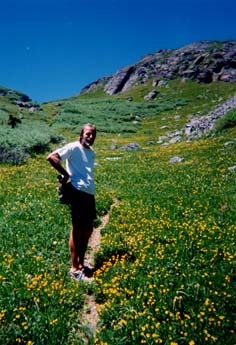 July 3, Bear Creek Trail (Hardrock course), 8000-9000 ft, 2 mi. 1 hr, sleep at 11,400 ft.
July 4, Silverton 10K in 51:33 (20'th of 100) at 9300-9800 ft, then hike last 15 miles of Hardrock in 8 hours at 10,000-13,000 ft. Sleep at 11,000 ft.
July 5, sleep at 11,000 ft.
July 6, sleep at 9300 ft.
July 7-9, Hardrock 100 in 42:17, 32'nd of 116 starters and 59 finishers. July 11, fly back to Florida. See the Hardrock home page for more information and pictures, or read Bob Boeder's book Hardrock Fever.